Let's face it, it's not much fun walking with a dog that pulls on the lead or jumps up at other dogs and their owners. That's why the Easy Walk® Dog Harnesses & Headcollars provide the perfect solution to all these doggy challenges. Recommended by vets and trainers, they're suitable for all types of dog and are available in a choice of sizes and colours. How do I use the Easy Walk® Harness? If your dog forges ahead of you, gently pull the lead to the side to turn the dog towards you. As he stops pulling, be sure to release the tension on the lead. Use praise and reward your dog with treats and/or petting. To slow your dog when he is pulling ahead, apply gentle pressure to the lead, pulling gently toward one side of the dog. Release the pressure on the leadwhen the dog is walking nicely next to you. 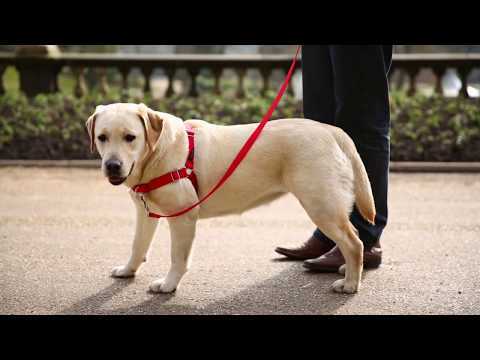 How do I know which size Easy Walk® Harness to buy? The correctly sized harness for your dog is determined by their width/girth measurement, as measured from behind their front legs. Measure your dog's width/girth by wrapping a tape measure around your dog's chest, just behind the front legs. How do I fit the Easy Walk® Harness? Open the quick-snap buckle on the belly strap. Place the shoulder strap over the dog's head with the chest strap resting on the dog's chest. Tighten belly strap to a comfortably snug fit. On medium-sized dogs, only allow room for about a finger's width under the strap. Allow a bit more for larger dogs, less for smaller dogs. Gently press fingers on the lower part of the front of the dog's chest to locate the breastbone. Adjust the shoulder strap so that when the chest strap is horizontal (parallel to the ground), the chest strap rests directly over the breast bone. AFTER you have tightened both the shoulder and belly straps, adjust the chest strap to fit securely. It should rest nearly parallel to the ground, not hang down or gape. You may need to remove the harness to make these adjustments. When the shoulder strap is fitted correctly, the chest strap should resemble a horizontal line (parallel to the ground), and it will rest directly over the breastbone. Attach the lead to the D-ring on the chest strap. How can I tell the Easy Walk® Harness straps apart? Each piece of your harness has an identifying feature. The shoulder strap features an Easy Walk® tag. The chest strap is clearly identified by the martingale loop and the D-ring attachment for the lead. The belly strap is an alternate but coordinating colour. Don’t choke chains or prong collars work just as well as an Easy Walk® Headcollar for controlling lunging and jumping? All dogs have a natural opposition reflex - if you push against them, they push back. Any collar that puts pressure at the front of the throat actually works against the owner by increasing the dog's instinct to pull forward. Not only do these products not solve the pulling problem, they can cause choking and pain for the dogs. The Easy Walk® removes a dog's instinct to pull forward by eliminating pressure from the throat area. Can I run while my dog is wearing an Easy Walk® Harness? Yes, but please be responsible. The Easy Walk® Harness was created for making walks with your dog enjoyable and pull-free. Should you choose to run or jog with your dog, please be mindful of the possibility of chafing and discontinue use at the first sign of discomfort. Can I use my harness with a retractable lead? We don't recommend using your harness with a retractable lead. With a retractable lead, your dog is rewarded with additional room on the lead when he pulls ahead. You want your dog to learn to not pull ahead. In addition, a retractable lead will always apply a slight constant pressure, teaching your dog it is okay to continue pulling. What happens if my dogs chews on his harness? We guarantee the materials and workmanship of the Easy Walk® Harness, but we can't keep your dog from chewing it! Please be sure to supervise your dog while he wears the Easy Walk® Harness and store it safely when not in use. If your dog does chew the Easy Walk® Harness, call our Customer Care Centre. What if pulling isn’t my dog’s only issue? For dogs with additional training issues like jumping, barking and excessive pulling and lunging, we recommend the Easy Walk® Headcollar as it offers owners much greater control. We also recommend the Easy Walk® Headcollar for dogs that are shy, nervous or fearful. The soft, comfortable nose loop and the snug, high neck strap have a remarkable calming and reassuring influence for these dogs. Professionals and owners alike are amazed at the greater confidence these dogs show when wearing the Easy Walk® Headcollar. Need a tool for dealing with more serious behavior problems such as aggression? We recommend the Easy Walk® Headcollar and the advice of a professional behaviorist, veterinarian, or trainer. The Easy Walk® Headcollar has been proven to be highly successful when incorporated into a behaviour treatment and modification program. The chest portion of my dog’s Easy Walk® Harness gapes when he walks. How can I fix this? Fit is crucial to the effectiveness of the Easy Walk® Harness. The width/girth portion (made up of the shoulder and belly straps) provide the foundation for a good fit and must be snug. The chest strap should also be correctly fitted, to avoid any drooping or gaping when the dog walks. If the chest strap will not adjust enough to give you a proper fit that is parallel to the ground, your dog may need a smaller Easy Walk® Harness.